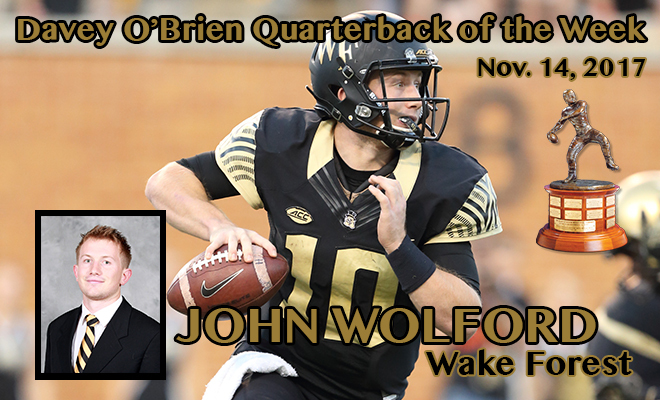 FORT WORTH, Texas (Nov. 14, 2017) – Wake Forest senior John Wolford has been named the Davey O’Brien National Quarterback of the Week for week 11, the Davey O’Brien Foundation has announced. Wolford amassed a career-high 499 yards of total offense as the Demon Deacons set a school record with 734 yards in a 64-43 victory over Syracuse on Saturday. In addition, he equaled the Wake Forest standard by accounting for six touchdowns. It was the second time in three weeks that he accomplished that feat. On the day, Wolford completed 25 of 38 passes for 363 yards and three touchdowns. It was his third consecutive 300-yard passing game. He also rushed 19 times for a career-best 136 yards and three scores. Wolford helped Wake Forest erase a 38-24 halftime deficit by completing 12 of 18 passes for 156 yards and two touchdowns in the second half. He also had 10 carries for 91 yards and a pair of scores. Wolford’s efforts put him on the Davey O’Brien Great 8 list the second time this season. The other “Great 8” quarterbacks in week 11 were: Lamar Jackson of Louisville, Buffalo’s Tyree Jackson, Baker Mayfield of Oklahoma, Oklahoma State’s Mason Rudolph, Brett Rypien of Boise State, Texas A&M’s Nick Starkel and Jarrett Stidham of Auburn.